Explore our 3D model of the gravestone of Edvard Grieg’s Scottish ancestors (below) – or better still in full screen here. Our 3D model music: Edvard Grieg Op72n13 Håvard Gibøens draum ved Oterholtsbrua – or in Scots Håvard Gibøens dwam by Oterholts brig (artist: Einar Steen-Nøkleberg). 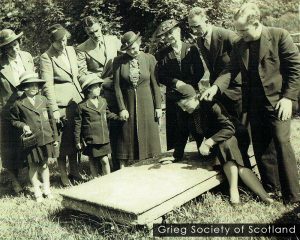 In 2018, the Grieg Society of Scotland stepped in to conserve and interpret the gravestone of Edvard Grieg’s Scottish ancestors at Rathen, in Aberdeenshire. Exposed to the elements, and biological growth, the stone’s inscription was in danger of being lost, and its story, for future generations, forgotten. But here, thanks to the imaging expertise of our conservation partners Spectrum Heritage, and support from the Heritage Lottery Fund, we have been able to capture the stone in 3-dimensional form, for all to see. At some point in the twentieth century, the stone, which was originally a ‘table monument’, was laid on the ground in a bed of mortar. This made it more secure, but more fragile too, as damp could take its toll, and grass and moss overgrow it more easily. Sadly, the original legs have long since been lost. But from a rare historical photograph presented to our Honorary Director not many years ago, we were able to see not only how they had been carved, but what an elegant construction they once had made, with the stone ‘erected’ upon them, just as the inscription tells. So, our project Monumentally Grieg! 3D model not only captures the inscription and the curved surfaces of the Edvard Grieg ancestral gravestone at Rathen, but reconstructs it for posterity too! Watch our Monumentally Grieg! film to get the full story of the stone – how it came to be erected, how we set about conserving it, and what it means today. 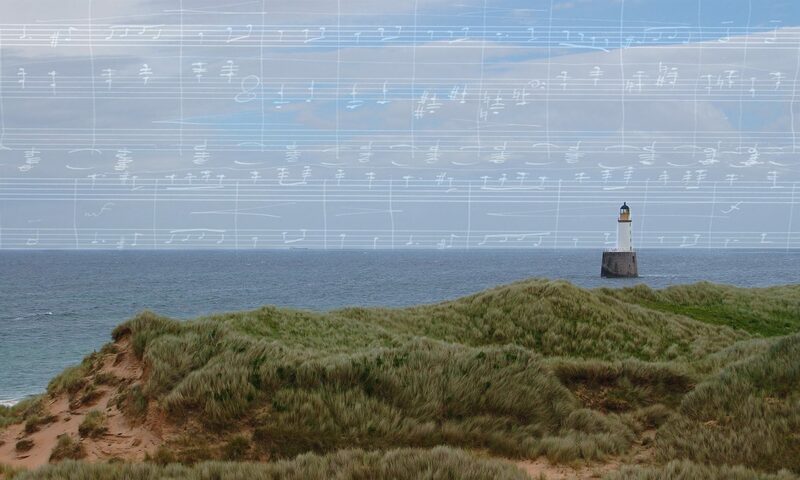 Learn more about project Monumentally Grieg! here.